Extra View is a way of getting more DStv channels into your home. 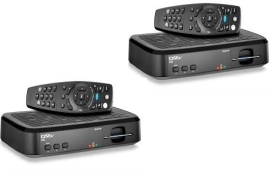 DSTV Extra View is a set up were it allows you to set up two Extra View capable DStv decoders at a cost of a single subscription, plus an access fee of R90 per month. This allows you to view two channels at once in two different locations within your home yet paying for one account. How does Extra view work? Basically, two decoders are linked to work under a single subscrition. Each decoder is independently connected to the satelite dish and each decoder has a smart card. In the extra view installation, one decoder is designed as the "primary" decoder and the other one is designed as the "secondary". The decoders are linked by a cable that allows communication between them and the primary decoder sends a "heardbeat" to the secondary decoder via this cable. If the cable is removed or the "heardbeat" lost, the secondary decoder will lose video & audio until the cable is replaced or the "heardbeat" resumed. There is no impact to the primary decoder if the cable is disconnected. The Extra view packages delivers an incredible full dual view viewing experience - allowing access to two different channels on two different TVs at the same time. This means, you are able to watch your favorite sport channel in the lounce, while the other members of your family are watching a different channel within the same house.